At ScienceOnline Together 2014, I moderated a session titled “social media as a scientific research tool” (background information here). We had a great discussion, and I wanted to thank everyone who came or participated virtually. For the benefit of those who couldn’t make it, I wanted to summarize our discussion. 1) Social media and “big data” can be an incredibly powerful research tool. The ability to study what hundreds/thousands/millions of people are saying, and therefore thinking, about a given topic has countless implications for research. I listed 5 examples in my background blog post, but we discussed many more in the session. 2) It is relatively easy to use social media as a research tool. Though some of the software, like Radian6, can be expensive, if your project is relatively small, it can be inexpensive (even free) and simple to get the data you need. To demonstrate this, attendee Edmund Hart performed an analysis of tweets about the NC Natural Sciences Museum within a few hours of my session ending. Someone made a NodeXL graph of the resulting #scioResearch twitter conversation before I had even gotten snacks in the break after my session. The programming involved is relatively simple, which means that, in the words of an attendee, even if you can’t do it yourself, buy your friendly neighborhood programmer a beer and they can do it for you quickly. 3) The ease in getting the data doesn’t mean that you shouldn’t involve a trained social scientist in study design and data analysis. In order to ensure that the data is analyzed correctly, be sure to involve someone in the project who is familiar with content and discourse analysis, the study of knowledge and attitudes, etc. Just because you can easily obtain the data does not mean that you have the training needed to properly analyze it. As has frequently been discussed, social science is a technical and rigorous discipline. 4) It is important to understand what data you AREN’T getting from social media. Any tool has its limitations. For example, if someone isn’t on twitter (for any reason, including but not limited to “doesn’t have a smartphone/computer” or “doesn’t live in an area with internet/3G”), then you simply won’t be able to study their knowledge and attitudes using their tweets. 5) There are important ethical considerations when using social media and “big data” to study certain subjects. While someone’s tweets are essentially public statements from a legal perspective, someone with only a few followers on twitter is probably not thinking of their tweets in this way. While a study like mine (knowledge and attitudes with respect to shark conservation and management) is unlikely to have any negative effect on the stakeholders I study, it is easy to see how a study that can detect medical conditions like post-partum depression can cause problems for the research subjects if the information gets into the wrong hands. As with any research involving humans, it is important to get approval from your Institutional Review Board (IRB). Thanks again to all who participated in the discussion! If you have any questions, please let me know in the comments! 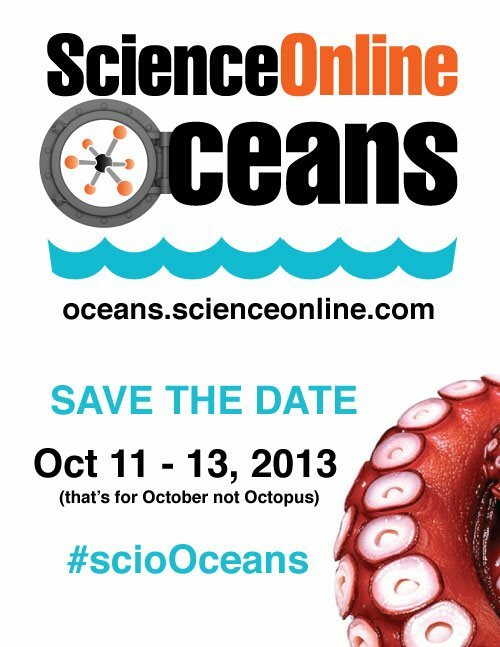 This October, I’ll be hosting ScienceOnline Oceans at the University of Miami. Registration is now open (register here), and we still have a few spots available. Here are 5 reasons why you should join us. 1) The people. The list of ScienceOnline Oceans attendees includes scientists, students, conservationists, journalists, and science communicators from all over the country, as well as (so far) Belize, South Africa, and Canada. It will be an excellent networking opportunity in addition to a lot of fun. 2) The program. Our program includes a huge variety of topics focusing on how marine scientists and conservationists can use the internet for collaboration, education and outreach. There’s something for everyone. 3) Be a part of the ScienceOnline community while trying something new. Since 2007, ScienceOnline has hosted conferences that have brought together thousands of scientists, science communicators, and science enthusiasts. There have been several regional meetings, but ScienceOnline Oceans ( and ScienceOnline Climate ) are the first topically themed conferences. 4) Miami. Miami is a beautiful, fun and active city. All conference attendees will get to experience some of the local charm on Saturday night, when we have dinner in the city in small groups at a variety of nearby restaurants. Attendees will also have the option of experiencing South Florida’s marine and coastal environment through post-meeting field trips, which include exploring the Everglades, snorkeling on a coral reef, or tagging sharks. 5) The hotel. Regular ScienceOnline attendees know that the conference hotel is the social hub of the meeting. 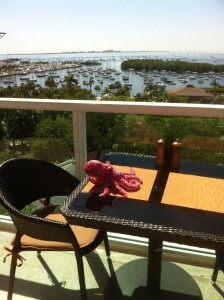 For ScienceOnline Oceans, we chose a beautiful hotel in a great neighborhood (Coconut Grove). Expect lots of late-night socializing in the rooftop pool bar overlooking the ocean. I am thrilled to officially announce Science Online: Oceans, which will take place in Miami this October! ScienceOnline: Oceans is affiliated with the North Carolina based ScienceOnline organization and meeting, and we hope to incorporate much of what makes those meetings so special, but there is one key difference that regular ScienceOnline attendees should be aware of. ScienceOnline: Oceans will focus exclusively on ocean science and conservation (and, of course, how these topics relate to the internet and social media). Who can attend? Anyone! Any interested scientist, journalist, student, blogger, communicator, activist, or member of the public is welcome. Due to logistical limits, we will have to cap total attendance at 200 (previously it was 150), including organizers, presenters, and attendees. Registration will open in March, stay tuned!